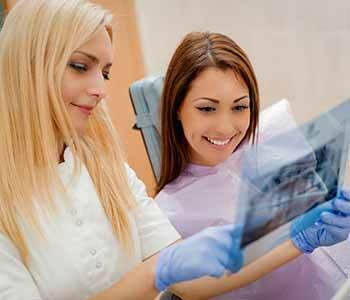 Visiting the dentist at least every six months is the best way to maintain a beautiful, healthy smile. Patients in and around the area of Calgary, AB can visit Dr. Hanif Asaria at one of his two conveniently located practices in the community to undergo routine examinations and dental X-rays. Our professionals will explain the importance of working with a dedicated dental team that focuses on preventive dentistry. When Dr. Hanif Asaria performs an evaluation at his practice, it is done to look for signs of decay or periodontal disease. A lot can be physically seen with the naked eye. However, a lot cannot. When it comes to diagnosing conditions and determining the source of a problem, such as a toothache, it is best for the doctor to take X-rays. Dental X-rays are perfect for allowing the dentist to see problems underneath the gum line, including issues with the teeth and the jawbone. It may indicate an impacted tooth such as a wisdom tooth that needs to be extracted or show decay that is occurring inside of a tooth and is not visible to the dentist. Dental X-rays allow the dentist to perform thorough evaluations and ensure that problems are caught early enough for successful interventions. 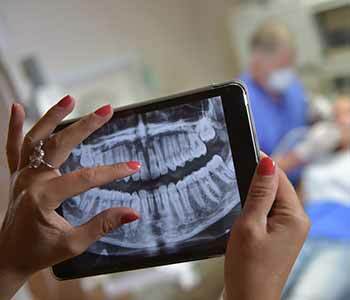 Who is a candidate for dental X-rays? Most patients can have dental X-rays completed in our office as they provide such a low emission of radiation to the patient. However, patients who are pregnant or may be pregnant will want to avoid having X-rays completed for the health of their unborn baby. Our team of professionals will find alternative ways to evaluate the smile and will make suggestions as to ways of undergoing an evaluation without X-rays when needed. Most patients will not have X-rays done at each visit in our office twice a year. X-rays are more commonly done if patients are complaining of a specific issue, allowing our dental team to diagnose the problem and find the source of the pain and discomfort. Alternatively, when we see a patient for the very first time in our practice, we also perform X-rays, so we have a good idea as to where patients are in their dental health journey. They may be done on a routine basis if patients have conditions that need monitoring such as periodontal disease, or to prepare for treatments such as dental implants when the bone must be assessed prior to performing placement. We commonly complete bitewing X-rays to be able to see in between teeth. X-rays are incredibly helpful to our dental staff for a variety of reasons. X-rays are done right in our office here in Calgary, AB. We have the equipment necessary to provide this evaluation and include X-rays when diagnosing specific conditions. X-rays are done with the care and attention of our dental hygienists who are experienced and trained in taking them in a safe and effective manner right at the treatment chair. What can I expect during my X-rays? Patients may need to turn their head or clench their jaw in a specific manner while undergoing their X-rays. We may even use plastic bite places to help. Patients stay very still for just a few seconds while the imaging is done. The X-rays are finished quickly and allow our team to assess the smile and diagnose any potential problems that may exist in the teeth, gums, or bone. At Calgary Dental Centers, our professional staff has your healthiest smile in mind! If you are interested in scheduling your routine dental visits with our team, we welcome you to book an appointment at one of our two conveniently located practices. Dr. Hanif Asaria and his team can be reached at (403) 768-1339 for a routine visit including a cleaning, examination, and dental X-rays.